Since we will be doing daily updates from the greatest spectacle in poker (the 2012 version) this will be the last tournament update for a while, but there was definitely plenty of tournaments taking place in the lead-up to the 2012 World Series of Poker, so here is a look at the players that cashed in just before heading to Vegas. The Heartland Poker Tour (HPT) was in Indiana at the Majestic Star Casino, and it was longtime poker player Daniel Acevedo whose star would shine the brightest out of the 377 player field, as the 39 year-old picked-up his first major tournament victory along with over $130k. If you think Cliff Josephy is only good at picking out stake-horses (hence his nickname of “JohnnyBax”) think again. Josephy just captured the $5k NLHE title at the Bellagio Five Star World Poker Classic, besting a tough field of 90 players, and pocketing $165k in the process. The latest stop on the Russian Poker Series (RPS) was in Kiev, and with over $750k in the prize-pool the final five players decided to lock-up as much cash as possible, cutting a deal that saws all five book a at least $73,000. In fact it was second-place finisher pocketing the most, while the perfectly named Dmitry Chop wound up with the lowest payout, a still impressive $73k for a fifth place finish. The Word Series of Poker Circuit Series held a massive event in New Orleans last week with Justin Truesdell pocketing over $200k for his victory over the 945 player field. 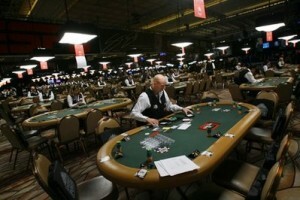 This entry was posted on Monday, May 28th, 2012 at 9:29 am and is filed under Poker News. You can follow any responses to this entry through the RSS 2.0 feed. You can leave a response, or trackback from your own site.